Leverage the true driver of ALL achievement and abundance — Your Power Habits! You've already learned HOW to succeed. You know HOW to set goals, HOW to use your power of thought, and HOW to take action to deliver results. But knowing HOW isn't enough to combat the unbending unconscious habits of your mind - habits that are stronger than your will and your behavior. For the first time in our modern era of personal development, we go beyond simply how to succeed and target the very unconscious habits that are preventing you from reaching all of your goals. In essence, permanently removing your foot from the brake and allowing you to race to a better career, financial future, relationship and life! 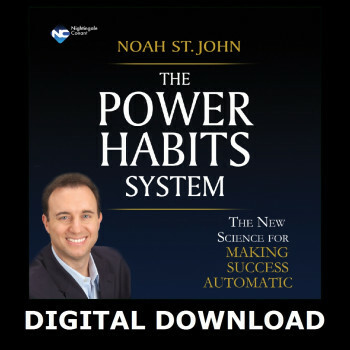 Using these "Power Habits", Noah St. John was able to quickly and permanently transform his life from one of dead-end jobs and endless debt, to worldwide notoriety, impressive business accomplishments and prosperity. Now, through The Power Habits System: The New Science for Making Success Automatic, he shares these life-transforming Power Habits with you. Your Self-Confidence: You will gain a new sense of value and appreciation for who you are, leading to heightened levels of energy, genius, and creativity. Your Happiness: You will experience a renewed zest and enthusiasm for life. Start Living Your Because - Noah's 12th Power Habit that enables you to enjoy the best that life has to offer including fulfillment, abundance and love! Activate these Power Habits and become fundamentally unstoppable. "Noah comes from his heart and shows you how to awaken your own inner power through the magic of a question." - Dr. Joe Vitale, Author of The Missing Secret and star of "The Secret"